Xiong'an New Area (simplified Chinese: 雄安新区; traditional Chinese: 雄安新區; pinyin: Xióng'ān Xīnqū) is a state-level new area in the Baoding area of Hebei, China. Established in April 2017, the area is located about 100 km southwest of Beijing and 50 km east of downtown Baoding. Its main function is to serve as a development hub for the Beijing-Tianjin-Hebei (Jingjinji) economic triangle. Additionally, "non-core" functions of the Chinese capital are expected to migrate here, including offices of some state-owned enterprises, government agencies, and research and development facilities. 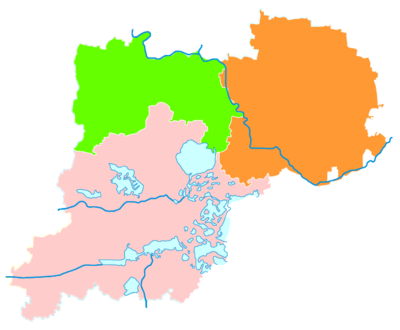 The area covers the counties of Xiong, Rongcheng and Anxin. Its name is a compound of the first elements of the names of two of them: Xiong and Anxin. The construction of the area is described as part of the "millennium strategy" (千年大计). Unlike other "new areas", Xiong'an's development is taking place under the direct oversight of the Central Committee of the Communist Party of China and the State Council. The temporary government office of the New Area is located in Ao Wei International Hotel (Ao Wei Mansion) in Rongcheng. China's central government was considering to relocate a number of Beijing's administrative and back-office functions to Baoding, as Xi Jinping, General Secretary of the Communist Party of China, told US former Treasury Secretary Henry Paulson personally in July 2014, and said this idea was his "own personal initiative", according to Paulson's memoir Dealing with China. The name and the location of the New Area was confirmed on a meeting of Politburo Standing Committee of the Communist Party of China on March 24, 2016. The announcement of the New Area. was released to public out of the blue on the afternoon of April 1, 2017. The information was so confidential that local government didn't know it in advance. Xi Jinping's visiting accompanied by Xu Kuangdi, former leader of Pudong New District, to Anxin on February 23, 2017 was revealed for the first time by news program Xinwen Lianbo on that night. It has an initial phase development area of 100 km2, composed of 60 villages in Rongcheng and Anxin. The New Area would plan to be eventually expanded to 2000 km2 in the future. Baiyang Lake, northern China's largest freshwater wetland, is also included within the new area. Baigou railway station and Baiyangdian railway station, on Tianjin–Baoding intercity railway, are within reach. Xiong'an railway station, on the Beijing–Xiong'an intercity railway, will open in 2020. It will be served by the newly constructed Beijing Daxing International Airport. It is currently served by two expressways, G45 and G18. A flood of footloose capital, much of it from Beijing, has been searching for properties in Xiong'an to invest, causing real estate price in this area to skyrocket rapidly since the announcement of the New Area. Local government has since imposed a temporary ban on new property sales. The model of real estate development in the New Area may use public housing in Singapore for reference, according to a senior officer's interview on People's Daily in April 5, 2017. ^ 成立两个月 雄安新区临时党委书记换将. caixin.com. 2017-06-03. ^ 受权发布：中共中央、国务院决定设立河北雄安新区 (in Chinese). Xinhuanet. 1 April 2017. Retrieved 3 April 2017. ^ 权威专家谈雄安新区：本质上就是国家副都. Ifeng Finance. Southern Weekly. 2017-04-04. ^ 详解雄安新区决策、选址经过. caixin.com. Xinhua. 2017-04-13. ^ 雄安新区成立前保密严格 筹委会官员昨“一对一”调研重点小镇. National Business Daily. 2017-04-03. ^ 推迟披露的行程，与这则重磅新闻相关. Beijing Youth Daily. ^ 雄安新区起步区为容城安新两县60村，彻底管死不增一砖一瓦. thepaper.cn. 2017-04-13. Retrieved 2017-04-13. ^ China to build massive city southwest of Beijing, Nikkei Asian Review, 2017-04-03. ^ "京雄城际铁路全线开工 新机场至雄安段2020年底投用". Retrieved 2019-03-07. ^ 雄安新区或借鉴新加坡模式. China Youth Daily. 2017-04-12. Anxin (Chinese: 安新; pinyin: Ānxīn) is a county in central Hebei province, China. It is under the jurisdiction of Baoding City, the centre of which lies about 40 km (25 mi) to the west, and as of 2006, it has a population of 420,000 residing in an area of 726 km2 (280 sq mi). Most of Baiyang Lake is located in the county. Anxin forms part of the Xiong'an New Area designated by the government in 2017. Anzhou (Chinese: 安州; pinyin: Ānzhōu) is a town in Anxin County, Hebei, China. It is not far from Lake Baiyangdian. Now it belongs to Xiong'an New Area. Baiyang Lake, also known as Lake Baiyangdian, is located in the Xiong'an New Area of Baoding, a prefecture-level city in Hebei Province, China. It is the largest freshwater lake in northern China. It is referred to as the Kidney of North China. Beijing Daxing International Airport (Chinese: 北京大兴国际机场; pinyin: Běijīng Dàxīng Guójì Jīchǎng) (IATA: PKX; ICAO: ZBAD), located on the border of Beijing and Langfang, Hebei Province, is Beijing's second international airport and is currently under construction. The name of the airport was announced on September 14, 2018. The terminal building, the largest single-building airport terminal with 100 million square meters, is expected to be completed on July 15, 2019, and the airport is expected to be open on September 30, 2019. Upon completion, it will serve as a major international hub airport in Northern China. There will be 4 runways, and approximately 80 parking bays, most of which can be configured to handle either one twin-aisle or two single-aisle aircraft. The new airport is expecting a total of 7 runways and another terminal to the south of the current one in the future, in order to accommodate 620,000 flights and 100 million passengers each year.The airport is 46 kilometers south of Tian'anmen Square, 26 kilometers west of downtown Langfang City, 50 kilometers northeast of Xiong'an New Area, and 65 kilometers from the existing Beijing Capital International Airport, and is expected to serve Beijing, Tianjin, and Hebei. It will serve as a hub for SkyTeam alliance airlines, while Star Alliance members will stay at the existing Beijing Capital International Airport. Hainan Airlines, which accounted for 10% of Beijing Capital International's passenger seat capacity in 2016, but is not part of any major alliance, will stay at the existing capital airport.Upon the opening of the new airport, Beijing Nanyuan Airport (currently solely served by China United Airlines) will be closed. The Beijing–Hong Kong (Taipei) passageway is a proposed high-speed railway passage in Greater China. It will run in a north–south direction from Beijing to Hong Kong, with a branch leading from Hefei to end at Taipei across the Taiwan Strait. It will connect the cities of Beijing, Xiong'an, Fuyang, Hefei, Jiujiang, Nanchang, Ganzhou, Shenzhen and Hong Kong on the main line, as well as Fuzhou and Taipei on the branch line. The line was announced by the Chinese government in 2016 as part of the national "eight vertical and eight horizontal" high-speed railway network. The Beijing–Xiong'an intercity railway (Chinese: 京雄城际铁路; pinyin: Jīng-Xióng chéngjì tiělù) is an intercity railway operated by China Railway High-speed, that will connect Beijing and Xiong'an. The section from Beijing to the new Beijing Daxing International Airport is expected to open in September 2019, and the airport to Xiong'an section in late 2020. Chen Gang (Chinese: 陈刚; born April 1965) is a Chinese politician currently serving as the Communist Party Secretary of the Xiong'an New Area, Vice Governor of Hebei, and a member of the Hebei provincial party standing committee. He spent much of his career in Beijing, before being transferred to Guizhou as party chief of Guiyang. Fuxing Road (simplified Chinese: 复兴路; traditional Chinese: 復興路; pinyin: Fùxīng Lù) is a road in western Beijing, China, forming part of the extended Chang'an Avenue. The entire road lies within the confines of Haidian District. It is believed to run from Gongzhufen on the West 3rd Ring Road through to the West 5th Ring Road; however, maps indicate its path from Muxidi Bridge (just before the West 3rd Ring Road) to Yuquanlu (just after the West 4th Ring Road). The Wukesong Indoor Stadium, a venue for the 2008 Summer Olympics, runs alongside the road. The venue has since then been renamed the "MasterCard Center". To the west of Fuxing Road is Shijingshan Road, while to the east of Fuxing Road is Fuxingmen Outer Street. Line 1 of the Beijing subway runs along the route. Jianguomen Inner Street (simplified Chinese: 建国门内大街; traditional Chinese: 建國門內大街; pinyin: Jiànguómén Nèi Dàjiē) is a major street in urban Beijing. It forms part of the extended Chang'an Avenue. Its path begins after the Dongdan intersection heading east until Jianguomen Bridge. During its short run, it crosses with the intersection to the Beijing Railway Station. The Beijing International Hotel also lies along its track, as does a main postal office and the building of China customs. The street ends near the Beijing Ancient Observatory. Line 1 of the Beijing subway runs along the route. Rongcheng (Chinese: 容城; pinyin: Róngchéng) is a county in central Hebei province, China. It is under the jurisdiction of Baoding prefecture-level city. The area of the county is 311 km2 (120 sq mi), while the county seat is located in Rongcheng Town. Xiong County or Xiongxian (simplified Chinese: 雄县; traditional Chinese: 雄縣; pinyin: Xióng Xiàn) is a county in the central part of Hebei province, China. It is the easternmost county-level division of the prefecture-level city of Baoding. It is part of the Xiong'an New Area designated by national government in April 2017. Xu Qin (Chinese: 许勤; born October 1961) is a Chinese politician, and the current Governor of Hebei. Previously he had served as mayor, then party chief of Shenzhen, China's most prominent special economic zone. Zhengzhou–Wanzhou high-speed railway (Chinese: 郑万高速铁路) is an under-construction high-speed railway connecting Zhengzhou, the capital of Henan province, and Wanzhou District in Chongqing. The railway was approved by the National Development and Reform Commission in 2014. Construction began in 2016, and the railway is estimated to be operational in 2022. Zhengzhou–Xinzheng Airport intercity railway (Chinese: 郑机城际铁路) is a regional higher-speed railway in Zhengzhou, Henan, China. The railway provides Zhengzhou city center fast train connections with Zhengzhou Xinzheng International Airport. It is a component of the larger Central Plain Metropolitan Intercity Rail network. With the opening of the railway, it takes only 19 mins from Zhengzhou East railway station to Xinzheng Airport.